Firefly - Serenity HUD Display, originally uploaded by avhell. 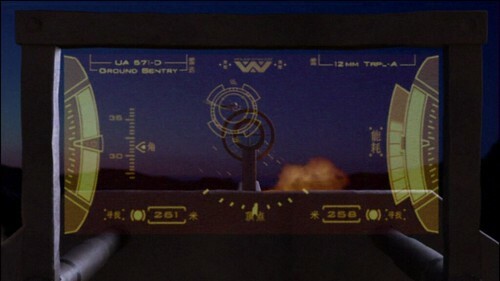 I know that the use of a logo from the Weyland-Yutani corporation from the “Alien” franchise in this first episode of Firefly is old news, but on examining it again earlier today I noticed that the gun designation in the upper left corner of the HUD in this screen grab shows UA 571-D Ground Sentry. The name sounded familiar to me. Upon investigation, it turns out I was right. In the extended version of “Aliens”, there is a scene with automated remote sentries. The model of those remote sentry guns were UA 571-C.
A coincidence? I think not! Especially given Joss Whedons hand in the franchise… Still, I thought it was a pretty cool, if obscure, reference.